I was missing the fabulous Cinco de Mayo celebrations that took place on my street growing up, and all of the delightful and delectable Mexican fare... and so I decided to make my own this year. I didn't have time to go to the store, so I searched my pantry and then for some recipes that coincided with my on-hand supplies... and this is what I came with. 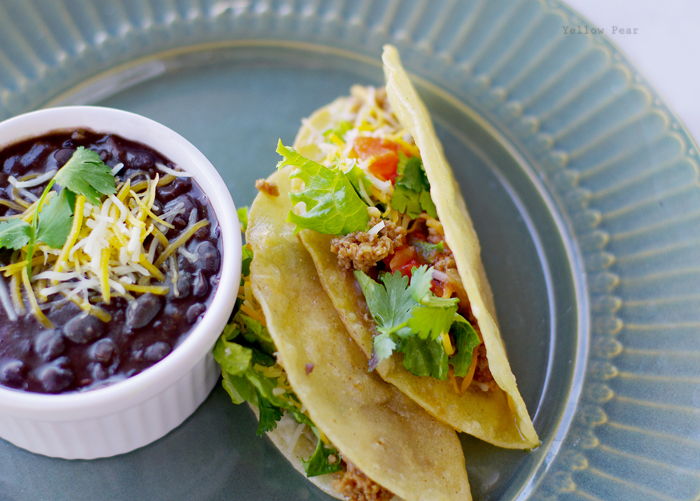 Black beans and tacos...per Our Best Bites. I love love love black beans and I've been on the lookout for a good recipe for years. Years, I tell you. And I finally found one. The beans are easy and super tasty...two things that are ultra high on my food priority list. As for the tacos, the recipe calls for a blend of spices, garlic and onions instead of pre-made taco seasoning, which turned out quite lovely. And I used ground turkey in place of the ground beef (because I like it and that's what was in my freezer). Also, frying your own taco shells just makes any taco better. Period. But. Our little Mexican feast was by no means a peaceful, sit-down meal. The two oldest had piano lessons that lasted until 5pm. We had a band concert for Miss B who had to get gussied up and be to the school early to practice. So I scurried and hurried and fried, stirred and chopped and then threw food on plates, tried to take a few snaps (and make it look pretty), shoved food in my own mouth, put shoes on the kids, put the perishables away, put a cake in the oven for Tres Leche (dessert) with strict instructions for the hubby who was staying home with a sick Q, grabbed gum, helped Miss B with final touches, and then ran to the concert. So, it wasn't the ideal situation...but it happened, which was (for the most part) all I cared about. And...I have leftovers for lunch. I do love leftovers. Ole! And nice work senora! Every recipe I've tried from Our Best Bites has been super good. I'll for sure have to try the tacos...with your modification of ground turkey! Yummy!! Id like to try the beans sometime...after hearing about your search for the besrt black beans..to have finally found an acceptable recipe!! Congrats! That looks so good! Sheesh, I want to come over to your house next cinco de mayo!